This recipe is not for everyone. If you have tons of time on your hand, love getting your kitchen messy, and feel a sense of accomplishment when you’ve created the ugliest copycat version of a Little Debbie…THEN this recipe may be for you. Seriously guys, I went back on forth on sharing this recipe. On one hand…they are freaking delicious!! On the other hand, a box from the grocery store is only $1.79, and much less messier. I get a small thrill making homemade versions of my favorite treats. They almost always taste better, and most of the time they are more cost effective. Today, they definitely taste better…but they aren’t as cheap. So it’s your call. Please don’t email me saying that these took you all afternoon and it would have been cheaper to buy a box. I get it. I hear ya. But…there’s a small part of you that had fun right? That showed your kids, look…we can do these at home! Have I talked you into or out of making this recipe? Either way, too late. I’m sharing it. I feel committed now. And if you were one of the people who posted on instagram that you want the recipe, you better dang well make them and share a photo tagging me! Got it? Use any flavor boxed cake mix. I used funfetti (cause honestly that’s all I had in my cabinet). But a white cake would be more traditional I suppose. You could go the chocolate route though, that would be delicious too! 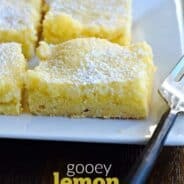 Spread your cake batter (you’ll follow the directions on the box for ingredients) into a 15x10x1-inch baking sheet lined with parchment paper. Bake in a 350 degree oven for 17-19 minutes. Cool your cake completely. Once cooled, get a 2 inch cookie cutter and cut those shapes. I made hearts for Valentine’s Day, but circles, squares, footballs…it all works. Use a spatula to lift your shapes out of the pan and place them on a wire cooling rack. Mix up your filling ingredients. Using a serrated knife, slice each snack cake in half (horizontally). Spoon the filling onto the bottom half of each cake. Add the top slice of cake. Grab your canned frosting out of the pantry. You’ll need TWO cans for this recipe. I used vanilla…but again, choose your favorite flavor. If you want to tint it pink, like I have done, add a very tiny amount before melting the frosting. I used this wilton pink gel. And all I did was stick a toothpick into the gel and add a tiny dollop to the frosting. Pour your frosting into a microwave safe bowl (with your food coloring). I did one can of frosting at a time. Microwave on high one minute. Stir until smooth, heat an additional 30 seconds. You want your frosting to be LIQUID. Place a piece of parchment paper under your wire cooling rack. Make sure the cakes are spread out on the rack. 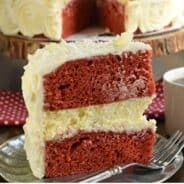 Pour the hot frosting over each cake generously until you’ve used all the frosting. Repeat with the second can. 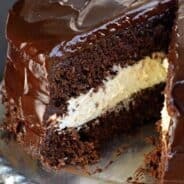 Allow cakes to set up, they may not be fully coated. And there’s a good chance you have about half a can of frosting on the parchment paper. You’re going to take a rubber spatula and spoon all the excess frosting back into your microwave safe bowl. Place that parchment back under your wire rack. AND reheat your leftover frosting. One last time, pour the last bit of frosting over the cakes…paying special attention to the areas not covered. Melt white chocolate in bowl, according to package directions. 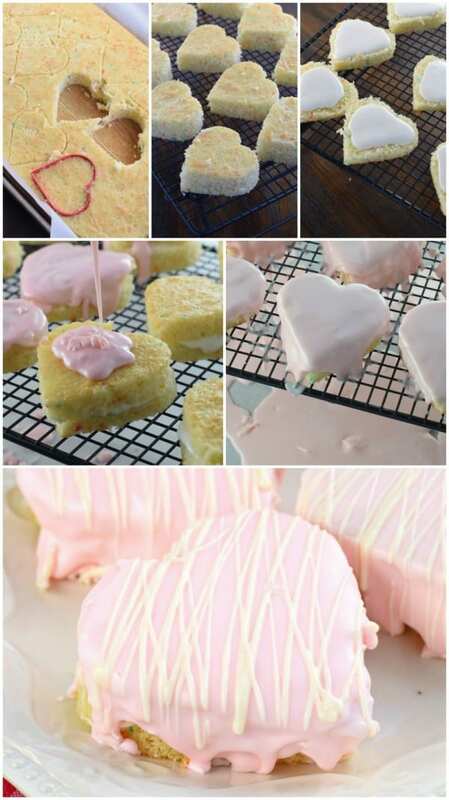 Place in a ziploc bag, snip off corner, and drizzle over cakes. Allow cakes to dry (about 30 minutes). Place cakes in a large cupcake container, or pie server and refrigerate until ready to eat. The frosting glaze may still be slightly soft, but oh my gosh it’s delicious! That’s it. That’s all. Will you try it? In a large mixing bowl, combine cake ingredients and beat for 2-3 minutes. Pour into prepared baking sheet. Bake for 17-19 minutes, until cake is fully cooked. Allow to cool. Using a 2 inch cookie cutter, cut desired shape snack cakes. Place cakes on a wire rack. Slice in half horizontally. In a mixing bowl, beat powdered sugar, marshmallow cream and heavy cream until smooth. Spoon filling over bottom half of each cake and add the top of the cake. Add one can of frosting to a microwave safe bowl. Heat in microwave for about 1 minute, stir until smooth and heat an additional 30 seconds until frosting is liquidy. Add one drop of pink food coloring and stir until smooth. Place wire rack of cakes over parchment paper. 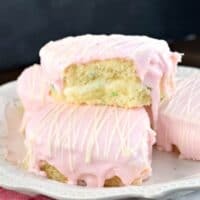 Drizzle melted frosting over each cake. Repeat with second can of frosting. Spoon all the remaining frosting on the parchment paper into the microwave safe bowl. Heat until liquidy again (about a minute). Pour over cakes one more time. 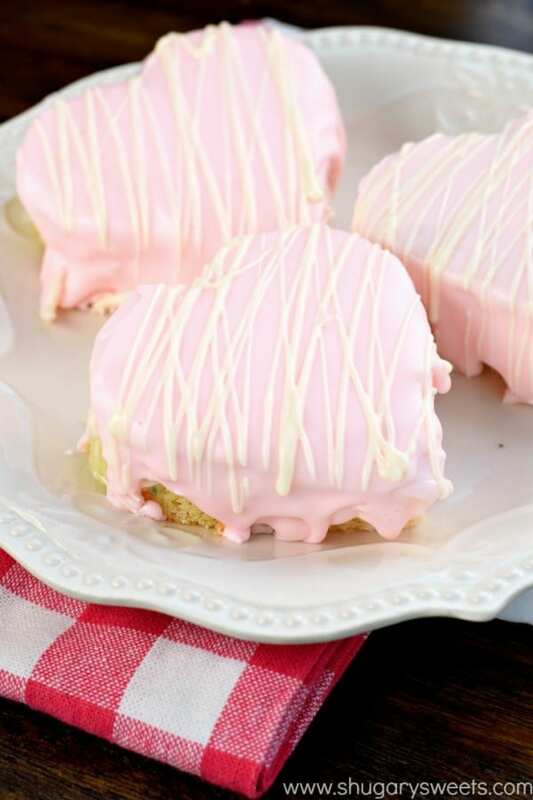 Drizzle melted white chocolate over cakes. Allow cakes to set, about 30 minutes. Refrigerate and enjoy! 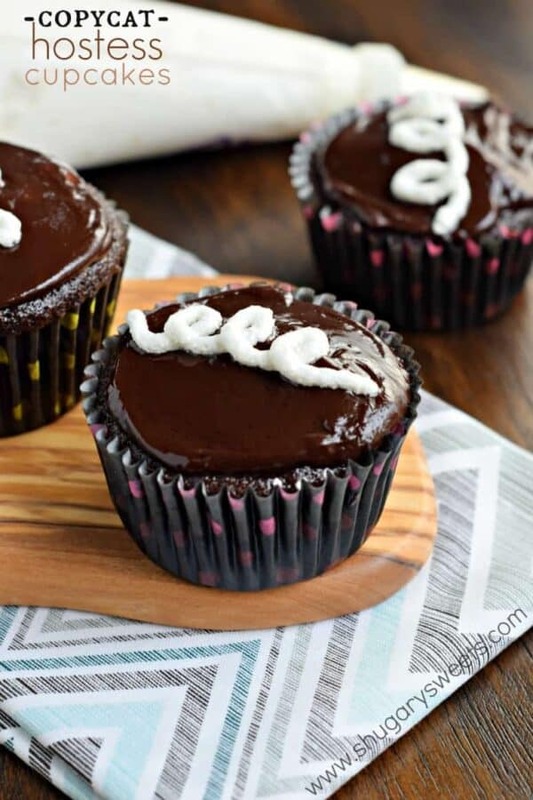 Hostess Cupcakes: a delicious copycat recipe for decadent chocolate cupcakes! 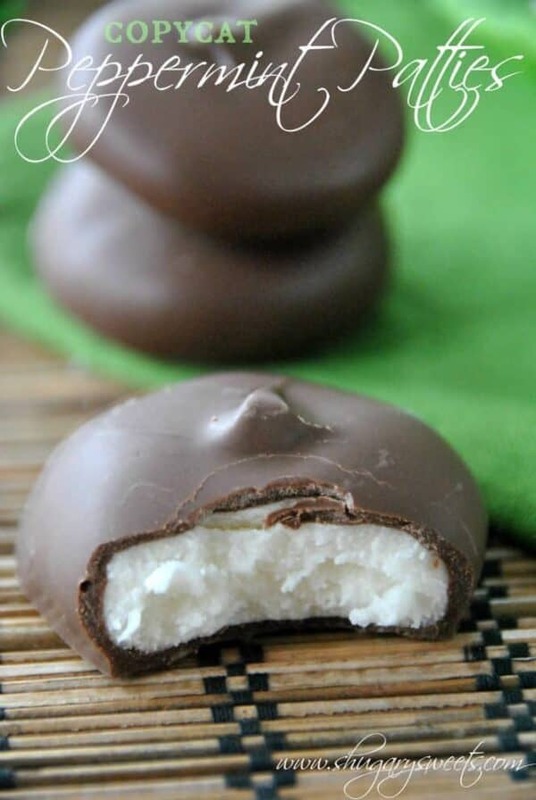 Copycat Peppermint Patties: melt in your mouth mints! 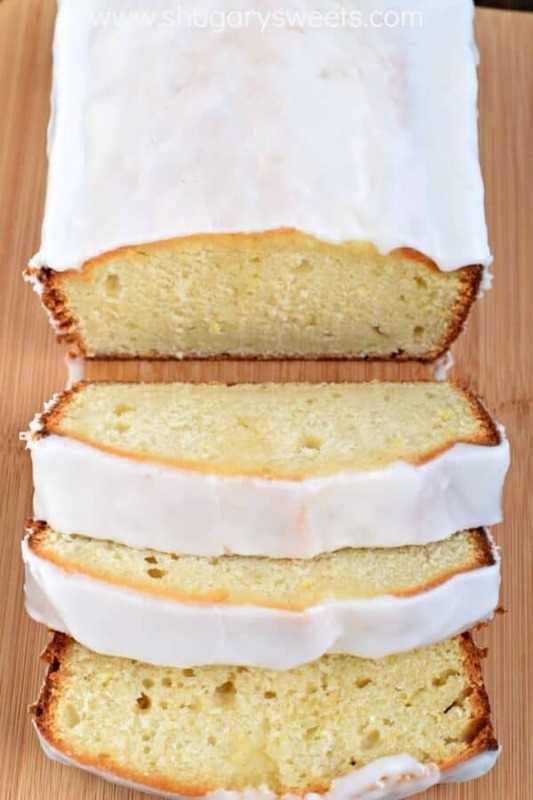 Copycat Starbucks Lemon Bread: super moist and delicious, better than the original! Whoa, Aimee. You are being WAY too hard on yourself. These are beautiful! And you made them funfetti! So I’m super glad you shared these, and that you love recipes that involve time and mess and frustration. Better you than me. I have a shorter fuse! I think they look great!!! 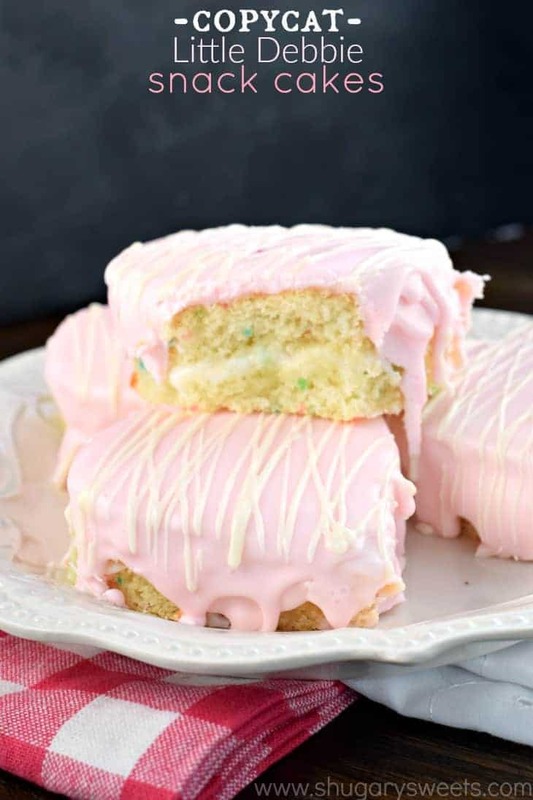 And they use cake mix and canned frosting…totally easy in my book!!!! What a fun recipe!! Perfect for Valentine’s Day treats!! Glad you shared it. I think they’re adorable and I love those Little Debbie cakes but would love yours more. 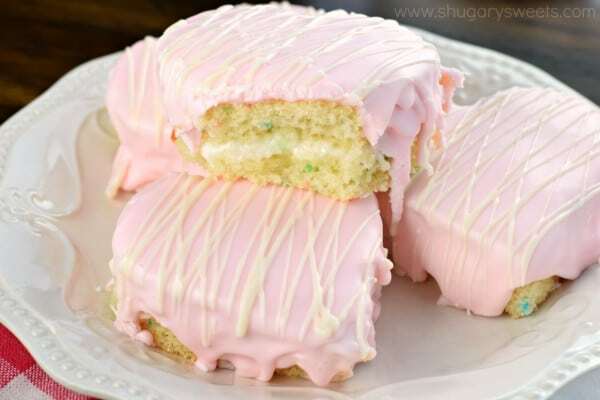 That is a great tip about microwaving storebought frosting to get a ‘glaze’ like this. Never knew that! These are BE.YOND! So perfect for Valentine’s Day, but really? I’ll eat them any day! You have the post the best things to make love it. I will have to go on a diet. Thanks for all you do . I love this post….can’t get any easier then this, and a perfect Valentine treat. Funfetti too…perfect choice….I’ve got to make these! If it tastes so good as it looks, this cake would be like a piece of heaven! I have not made these yet but I did just make hearts out of brownies with melted canned frosting. I found if you refrigerate the cake/brownie to get it cold then cut the shapes you get a nice clean cut.